As a New Jersey blogger and event planner, I love when I can combine my love for New Jersey with the thrill of planning an event, especially when it means I can introduce others to new places. I that chance this past July when as part of Jersey Family Fun, I cohosted a pop up yoga event with McDonald’s of the Greater Philadelphia Area and later took them to a quiet beach in Somers Point. The event was open to bloggers, their families, and the public, and was held to help relaunch McDonald’s Asian Salad. 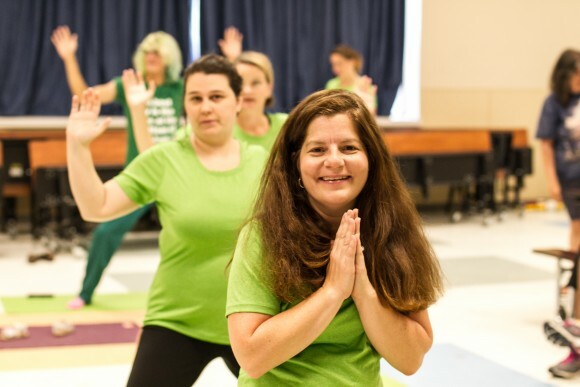 On July 9, Philadelphia area bloggers came together with their families and Ronald McDonald for a yoga class at the Somers Point McDonald’s. Our class was lead by a Hummingbird Yoga instructor and was initially supposed to be on the front lawn of the McDonald’s, but Mother Nature had other plans. Unfortunately, the grounds were pretty wet from the morning’s rain, but it wasn’t wet enough to dampen our spirits or desire to learn and stretch. Our friends over at the Charter Tech opened their doors and inside gym to us. Ronald McDonald participated, big red shoes and all. He was a great yoga student and must have taken lots of notes between stretches. 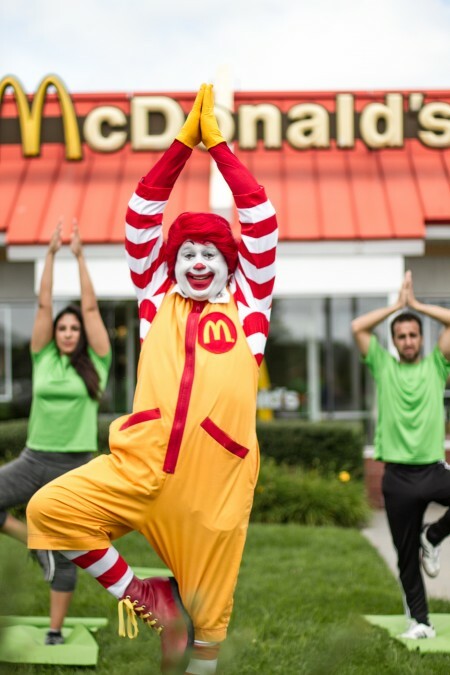 Later on, when most of us were enjoying our McDonald’s Asian Salad, I discovered him on the front lawn leading a yoga class. His students, members of the Tierney Agency, and PSMM’s own, Aida were right there with him. 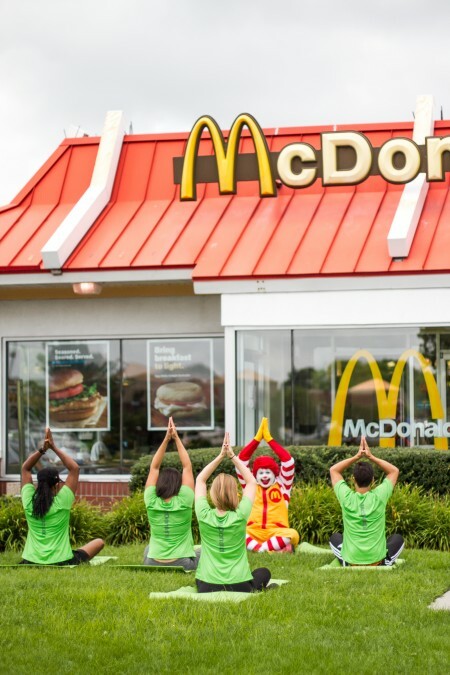 In fact, that’s what all of us did during McDonald’s Pop Up Yoga Event to relaunch the Asian Salad. We actively shared details and images on Facebook, Twitter, Instagram and more. It’s a fun part of our job, but it’s also a significant benefit to having bloggers at an event. 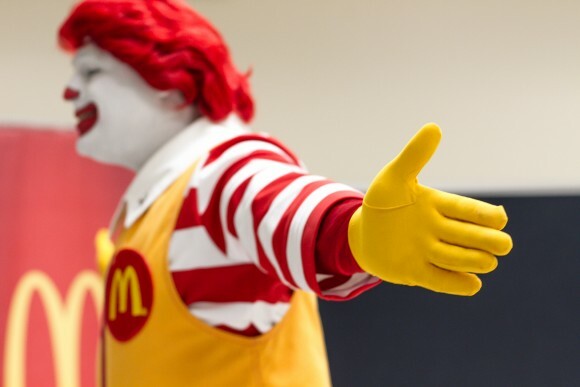 By involving bloggers to attend and hiring a blogger to cohost the event, McDonald’s of the Greater Philadelphia area ensured that the news of the Asian Salad was not just amplified across all of their networks but also all of ours.